Today I have another recipe that I have updated from the archives. I have some really good recipes from before when photography was not a huge focus of mine on the blog. By no means am I a professional photographer but I do feel that my photography has evolved since I first started this blog and some of my older post make me cringe with the poor photo quality and lack of style. As the saying goes, we eat with our eyes, and for me at least this is very much true. I am usually drawn to recipes due to the beautiful photos used so I feel that if you can barely distinguish what it is I am showing in some of my post chances are you probably will not be making it. Fair enough, however, some of these are too good to be ignored and they definitely deserve a bit of an updated look. 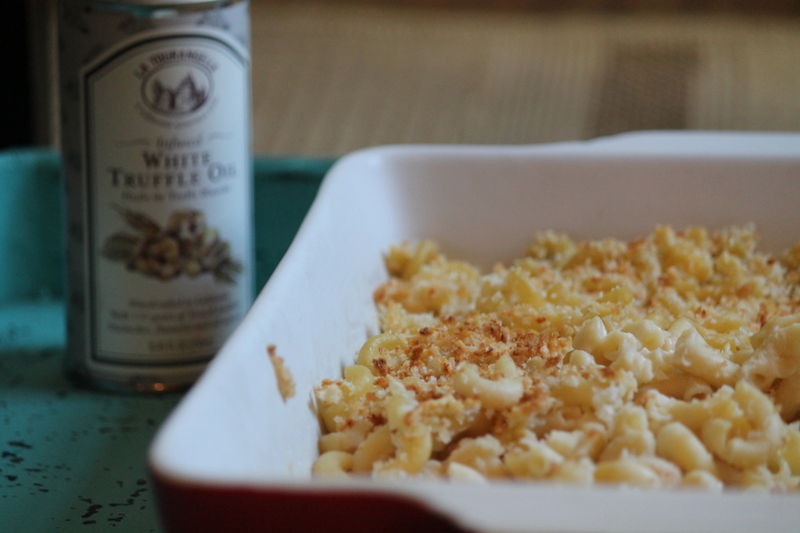 This macaroni and cheese with truffle oil is a prime example. To see the older post you can click here. Several years ago while Jason and I were in New York we stopped inside this restaurant near our hotel for dinner. On the menu they had what was called the Mac Attack, a tasting of all three of their macaroni and cheese dishes, none of which were your typical mac and cheese. Umm, yes please. One of the pasta dishes was made using truffle oil and it was out of this world good. 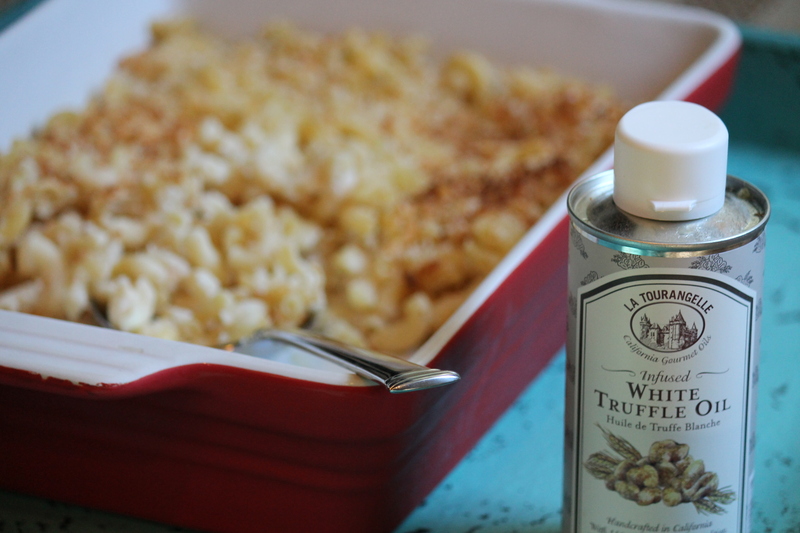 The truffle oil added so much dimension and flavor to the dish and as soon as we were back from our trip I bought a bottle so I could put it on All.The.Things. 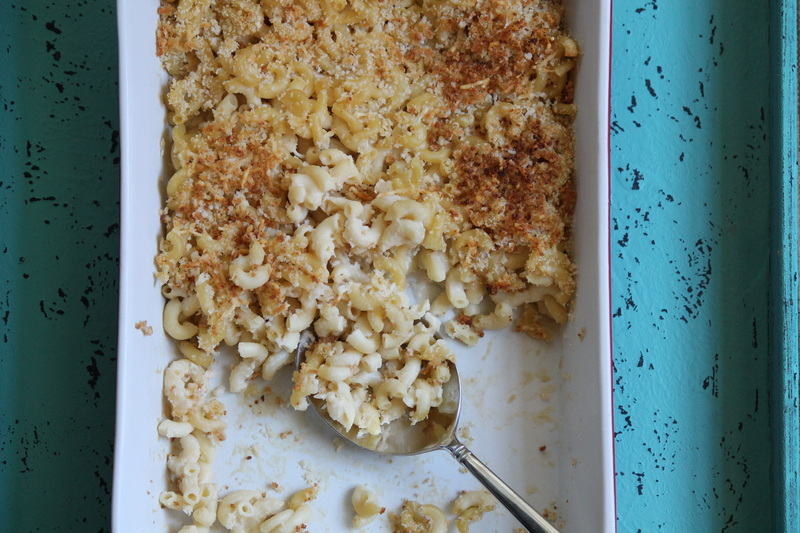 Shortly after we returned home from our trip I came across this recipe for truffled mac and cheese in the Cooking Light magazine and immediately tore it out. From the time I was a little girl macaroni and cheese has always been one of my favorite foods. As I got older it wasn’t something I made often at home but after having a little girl of my own this child hood favorite has become a staple in our house again. Jason and I were able to enjoy this grown up version while pleasing the little one with her own separate bowl of the mac and cheese mixture without the truffle oil. It was a win win for all. The intense, earthy flavor of the truffle oil takes this world-famous dish to a whole new level. Heat 1¾ cups milk and onion in a large saucepan until tiny bubbles form around edges (do not boil. ) Cover and remove from heat; let stand for 15 minutes. Strain milk mixture through a colander over a bowl; discard solids. Return milk to saucepan over medium heat. Combine remaining ½ cup milk and flour in a small bowl, stirring until blended. Gradually stir flour mixture and salt into warm milk, stirring constantly. Remove from heat; let stand 6 minutes or until mixture cools slightly. Gradually add Gouda and Gruyere cheeses, stirring until cheeses melt. Stir in Pasta and truffle oil. Spoon mixture into a broiler-safe glass or ceramic baking dish. In a small bowl add the panko bread crumbs, Parmesan cheese, and a drizzle of olive oil, Mixing well. 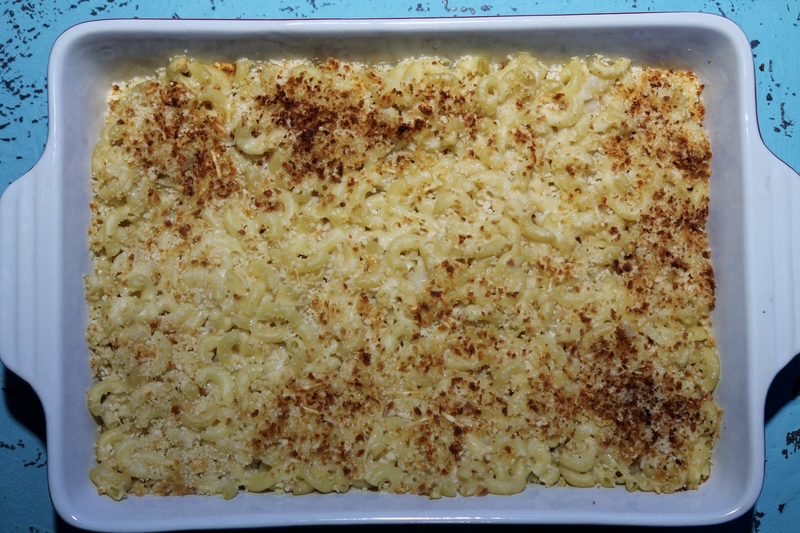 Sprinkle mixture evenly over top the macaroni and cheese. Place dish on middle rack of the oven; broil till golden brown (about 2 minutes). I LOVE truffle! 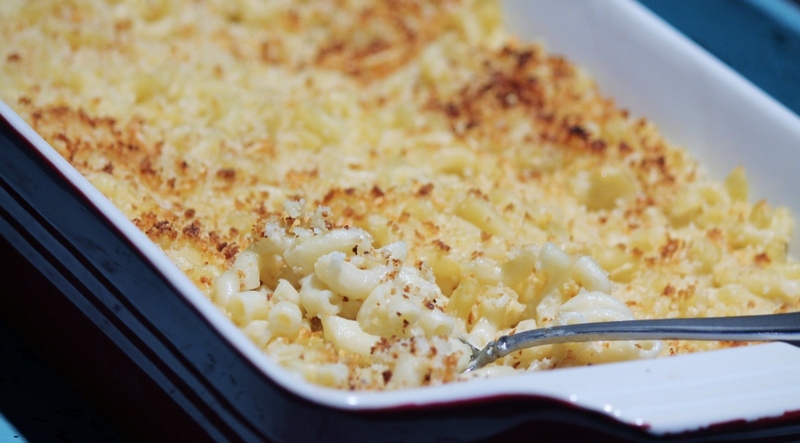 I can just taste how delicious this mac and cheese is already!